View of Chicago Lake Shore & South Bend 73, built by Niles in 1908 and now being completely rebuilt in Murphysboro, IL. 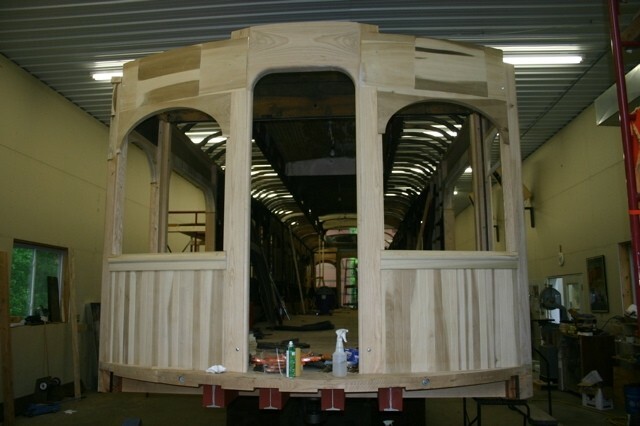 This picture shows the front end of the car, essentially all new wood. Photo by Gary Stott, courtesy Bob Harris. Photographed by Gary Stott, May, 2008. Added to the photo archive by Frank Hicks, May 18, 2008. Railroad: Chicago, South Shore, and South Bend.